Oops! This may be the start of an addiction.....tent cards and tealights (battery, of course!). There is something fascinating about the light coming through the delicate die cut patterns of the Tonic Studios Verso dies that just makes me want to make more and more of these. 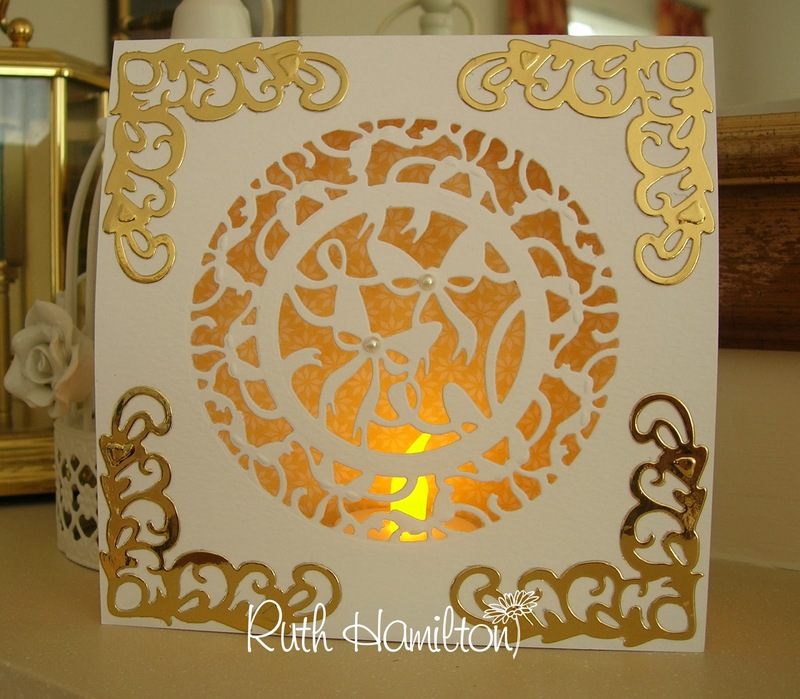 In this card I've used two of the dies from the Decorative Bow Rings set to create a central pattern and added 4 gold corners from the Fanciful Flourish die set. As the actual card is a 15cm square I cut a strip of card 15cm x 6cm to create the "tent" effect. I scored this at 1cm, 3cm and 5cm on the short side; folded the centre score upwards so that the card would lie flat when closed; and folded the two edges down and added a strip of DST to each to attach them to the card.